‘Oh give me a home where the buffalo roam,’ begins the classic Western song, which in 1947 was adopted as Kansas’ official state song. However, it’s South Dakota—not Dorothy’s home sweet home—that’s making us want to throw on our cowboy hats and giddyup onto the plains this month. 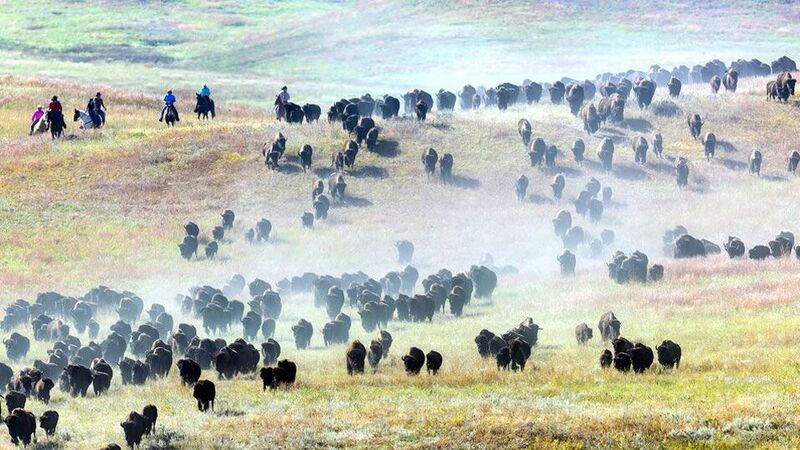 Billed as the largest event of its kind in the United States, the Custer State Park Buffalo Roundup is nothing if not a spectacle. Visitors show up as early as 6:15 a.m. to catch the action, lingering over pancakes and sausages, while wranglers work a free-roaming herd of 1,300 bison into corrals (the entire roundup lasts four days, but the main event is Friday September 25). Why should you go? Aside from the park’s stunning beauty, and the chance to see real cowboys cracking whips alongside the charging herd—the area holds a special claim on American culture. In the late 1980s, it was the backdrop for Kevin Costner’s epic film Dances with Wolves, which went on to win seven Academy Awards. The park itself offers plenty more to see than just bison: pronghorn antelope, mountain goats, bighorn sheep, deer, elk and wild turkeys reside here, too, making this a one-stop Noah’s Ark for wildlife lovers. Just outside the park, Crazy Horse Memorial aims to be the world’s biggest mountain carving (it was started in 1948 and work is still ongoing). On September 27, as part of the annual Fall Volksmarch, travelers can actually hike 6.2 miles to the monument’s top, something only offered twice a year. Oh, and speaking of monuments: Mount Rushmore, with its 60-foot presidential likenesses, sits just 15 miles north. For more information on visiting the park, one of the largest state parks in the country, visit their website.